One would assume there is a lot of tension in the hall when tomato historians gather for their professional conferences and symposia. That’s because there is general agreement among them on only a few basic facts; after that, tomato lore is a stew of opinions, legends, and outright falsehoods. To separate fact from fantasy, let’s begin by summarizing the points on which tomato authorities are able to agree. The plant is native to South America, and somehow made its way to Mexico, where it was grown by Aztecs. There is evidence that they ate tomatoes in a mixture with peppers, corn, and salt — in effect, a primitive salsa recipe. In Britain and its colonies, the tomato was believed to be poisonous, or at least inedible, until the mid-1700s. That may have been due to its being of the genus Solanaceae, making it a cousin of deadly nightshade. The British had a lot of experience with inedible food since that was pretty much all they ate, so someone eventually bit into one and convinced others to do likewise. How Americans were persuaded to try tomatoes is frequently explained by an anecdote that has gotten wide circulation, but is sneered at by the cognoscenti. Supposedly people in the United States were afraid to eat raw tomatoes until 1830 (or 1820, according to some), when a man named Colonel Robert Gibbon Johnson stood on the steps of the courthouse in Salem, New Jersey, and dared to eat one (or several, depending on whom you believe). The assembled crowd gasped, expecting Col. Johnson to drop dead. When he didn’t, hearts and minds — and appetites — were changed. It’s a nice story, but in his groundbreaking work The Tomato in America, author Andrew F. Smith insists it isn’t true. Even if it isn’t, it should be noted that the tomato is now the state vegetable of New Jersey. That is in spite of the assertion by some that the tomato is not a vegetable at all, but a fruit. Space does not permit us to explore that controversy. In 1897, Joseph Campbell put condensed tomato soup on the market, increasing American consumption of the vegetable (or fruit). Today, the United States produces around eleven million tons of tomatoes, making it second in worldwide production to — who else — China, which grows thirty million tons of tomatoes annually. So now you’re up to date. And before you try to lure me into the toe-may-toe/toe-mah-toe dispute, let’s call the whole thing off. This entry was posted in Dining, History and tagged tomatoes. Bookmark the permalink. As you noted, people aren’t afraid of tomatoes anymore; I was just reading an article in Vegetarian Times that listed tomatoes as one of the top 10 antioxidant boosters. 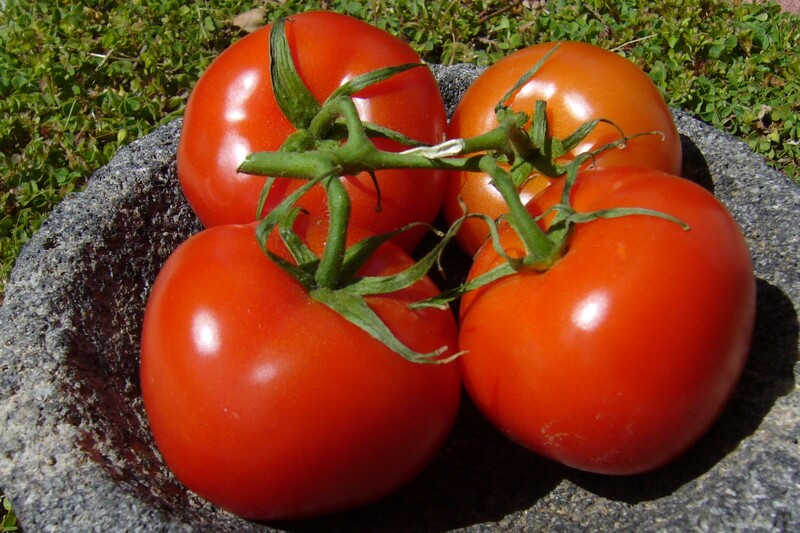 Apparenly they’re full of the “powerful” antioxidant lycopene, which makes them red in addition to reducing the risk of prostate, lung and stomach cancer, as well as heart disease and macular degeneration. Interesting side note: cooking breaks down the cell walls to release the lycopene and allow the body to absorb it – so canned tomato sauce is a good thing. How’s that for a way to rationalize the health benefits of pizza? Sounds good to me. And if you come across any research that touts the virtues of bubbling hot cheese, be sure to let me know!